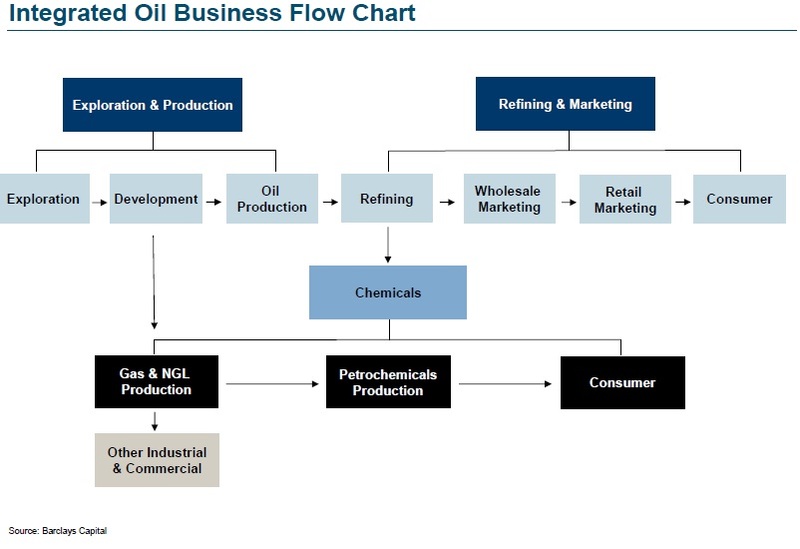 The Oil & Gas industry can be sub-divided into three compoents of the value chain: Upstream, Midstream, and Downstream. Upstream: This segment includes the exploration and production (E&P) of oil and natural gas and all associated activities. Companies include E&P, drillers, and service companies. Midstream: This segment includes the transportation of oil and gas from producing areas to refineries. Companies include pipelines, processing facilites, and storage facilities. Downstream: This setment includes refining, marketing and selling of end user products such as gasoline, jet fuel, heating oil, diesel, and propane. Companies include refineries, petrochemical companies, natural gas distribution utilities, oil product wholesalers, and local gas stations. Many companies chooose to focus on one segment of the value chain while others that participate in more than one segment are known as integrated oil companies (IOC). Natural gas producers drill for gas and sell the gas at market hubs around the US at prevailing prices after deducting gathering, processing, and transportation costs. Total gas production is relatively constant throughout the year. Depending on weather and other factors, demand may vary considerably. The bulk of storage facilities are located near the refining and petrochemical complexes of Texas and Louisiana coasts and in the mid-continent in central Kansas. Natural gas is used for heating and electricity generation. About 22,000 miles of gathering lines deliver gas from the wells surfaces to processing plants, where residuals are removed in order to prepare the gas for long-haul transportation. Gatherers collect a fee based on the volume of gas gathered before it enters the plant inlet. The processing plants, typically owned by gatherers, either roll the processing fee in with gathering fees or enter into various types of processing contracts. After the gas is processed, it enters the 300,000 miles of interstate pipelines, where gas is delivered to various market hubs and city gates. Compressor stations are used to move the gas within the pipeline system. Pipeline operators charge a tariff to shippers and do not take ownership of the natural gas. Shippers include producers, gas utilities, industrial consumers, power plant owners, and gas marketers. Pipeline companies transports the gas across the country and sell it to gas utilities. After reaching market hubs or city gates, local distribution companies (gas utilities) take ownership of the gas and deliver it to about 62 million customers on about 540,000 miles of distribution mains.